Learning doesn’t just take place in classrooms—sometimes you need a little more space to get out under the sky and get your hands in the dirt. To maximize learning spaces at our school, we built and continue to utilize two incredibly healthy and interactive Teaching Gardens. Children are inspired by planting their own crops, nurturing growth in their plants, and harvesting their own product. Bertschi kids examine plants close-up, learning how NW Native Peoples used plants, flowers, and bark for everything from tools to clothes and medicine. Bertschi’s organic garden is a hands-on program that helps educate our children about the values of organic farming, growing one’s own food, and supporting others in need. Students in the Extended Day program do the planting, weeding, watering and harvesting of the garden. 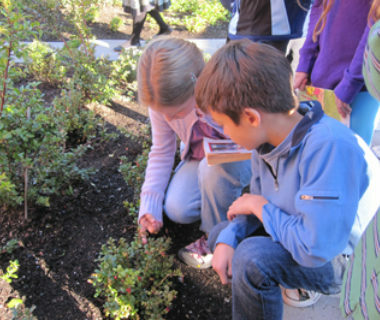 Because almost every Bertschi student goes to Extended Day at least once a year, all students are able to participate in the community garden that includes such plantings as lavender, lettuce, parsley, red cabbage, chives, strawberries, snow peas, rosemary, orange mint, chocolate mint, thyme, and marjoram. This bountiful addition to the campus is located at the West end of the main playground, just outside the world cultures room. A perfect location, as it allows students to use water collected in our cisterns that easily flows downhill with no need for a pump. 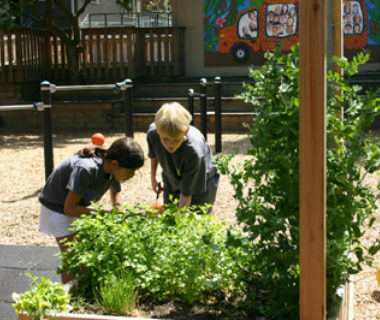 Because it is literally on the playground, students walk by their garden daily and watch it transform with the changes in season and weather. The harvest from the garden has been utilized entirely as snacks in the after school and summer programs. Just this last winter, students cooked their own potato leek soup and made a delicious kale salad. Who knew kids would be so excited to eat their green vegetables?! Designed as an outdoor classroom, this garden preserves indigenous NW plants and uses them in hands-on environmental education taught within the context of social responsibility. “Ethnobotany” is the study of the relationship between people and plants. This garden is used to help teach our curriculum on northwest native culture and history. Most of the plants used by “Pre-European” Northwest Native People for food, fiber and medicine are shade tolerant, so they can be grown here in this beautiful shade garden. These plants provide lessons both in the variety of “productive landscapes” and the ingenuity of Native Peoples. Students also benefit from our glass-walled “Eco-house” structure, which opens directly onto an outdoor plaza/classroom. No matter the weather, they can meet in the Eco-house to examine plant samples, start new plants, and experience hands-on learning about how helpful plants can be to humans. Take a closer look at all the plants that our kids get to grow and learn from in our Ethnobotanical Garden Plant Database.